Yesterday I learnt Spanish and when I tried to reconstruct a text I found out that I do not remember the small words like articles and prepositions. They were so small that I did not pay enough attention to them to remember them. Interestingly my students have similar problems with prepositions in English. Therefore I have decided to add more posts on prepositions here to help them. There have already been several posts on prepositions: Adjectives and prepositions, Nouns and prepositions and verbs and prepositions. In this post you can find a mind map and two games. Unfortunately the games aren’t mobile friendly. 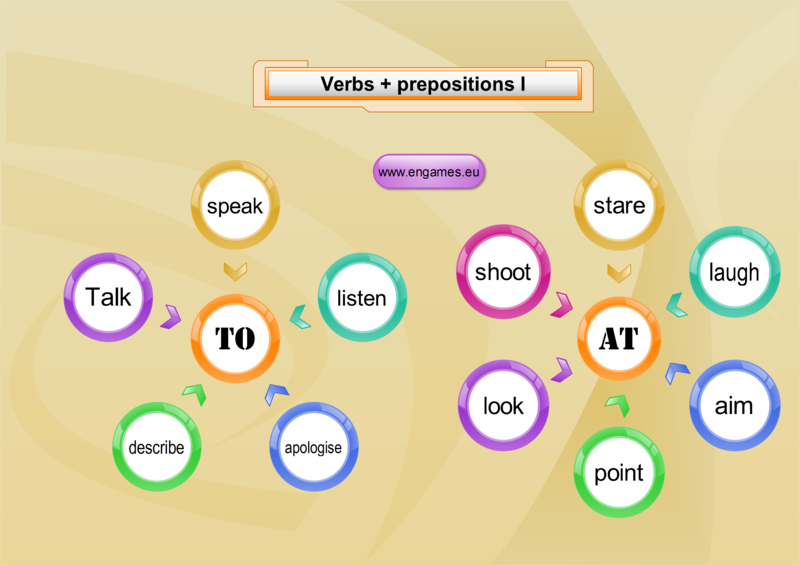 Have a look at the mind map and try to remember the prepositions that are connected with the verbs. Do you think you know the prepositions? Test your knowledge in the game called On Target. Choose the best preposition and then try to shoot the bad ducks. You can get a bonus if you shoot one of the bottles. The second game is called Teacher invaders. To stop the invasion you have to shoot all the monsters and complete each sentence with the best preposition available.